The Blue Mountains are a mountainous region in New South Wales Australia which boarders Sydney's Metropolitan area. The area gets it's name from the blue tinge the range takes on when viewed from a distance. The large sandstone plateau is dissected by gorges of up to 760 metres in depth, and has high points up to 1,190 metres above sea level. The native Aborigines inhabited the area for millennia prior to pioneer settlement in 1788 and so the area has significant cultural and historical importance. The Three Sisters are 922, 918 & 906 metres tall, respectively, which is over 3000 feet above sea level. The Aboriginal dream-time legend has it that three sisters, 'Meehni', 'Wimlah' and Gunnedoo' lived in the Jamison Valley as members of the Katoomba tribe. 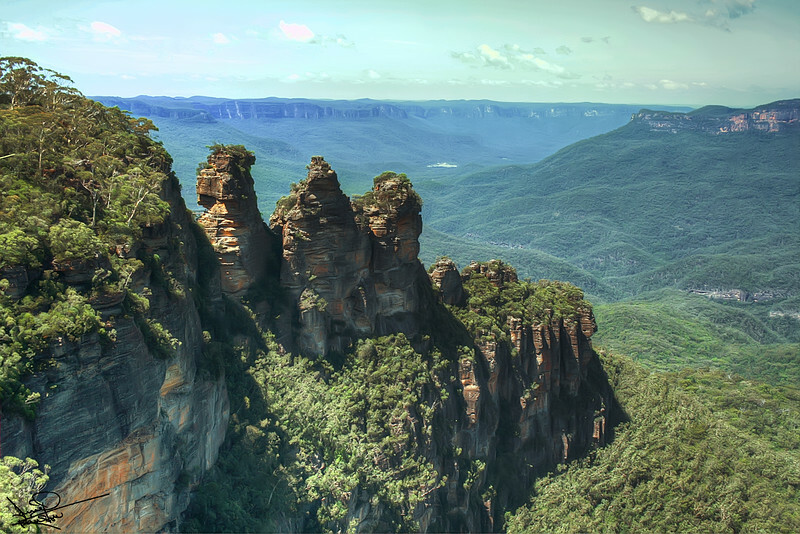 As the lives of the three sisters were seriously in danger, a witch doctor from the Katoomba tribe took it upon himself to turn the three sisters into stone to protect them from any harm. While he had intended to reverse the spell when the battle was over, the witch doctor himself was killed. As only he could reverse the spell to return the ladies to their former beauty, the sisters remain in their magnificent rock formation as a reminder of this battle for generations to come. Taken in late February 2008.